Admittedly Merging Lanes Love has gone dark over the last couple of months. We’ve officially hit the 5 month mark for the wedding, work has had a major upswing in activity, and did I mention we’re moving? It always seems that the busyness of life compounds. But, that just means, sometime soon we’ll be enjoying the lazy pace of summer. In the mean time, we’re spending spare moments packing up the house and preparing to move into a condo we’re renting on the west side of town. While I hate the moving process, one of the good things that comes out of it is a chance to purge. After all, there’s no point in moving something if you’re not going to use it. A couple of weekends ago, I took some time to organize, pack, and purge the hall closet where most of my craft supplies are stored. At the bottom of said closet, however, was a large bin that was previously stored in my parents garage for over a decade. I believe I packed it away when I was 18 or 19 and have not looked inside the box since then. On Sunday, I decided to take a look inside the box, and I took a tumble trip down memory lane. It’s amazing – the things that I thought were worth holding on to at 18. Before tossing some things aside and sending some things off to be donated, I snapped some pictures to share so you could make this trip with me. I’ve laid it out high school yearbook superlative style. 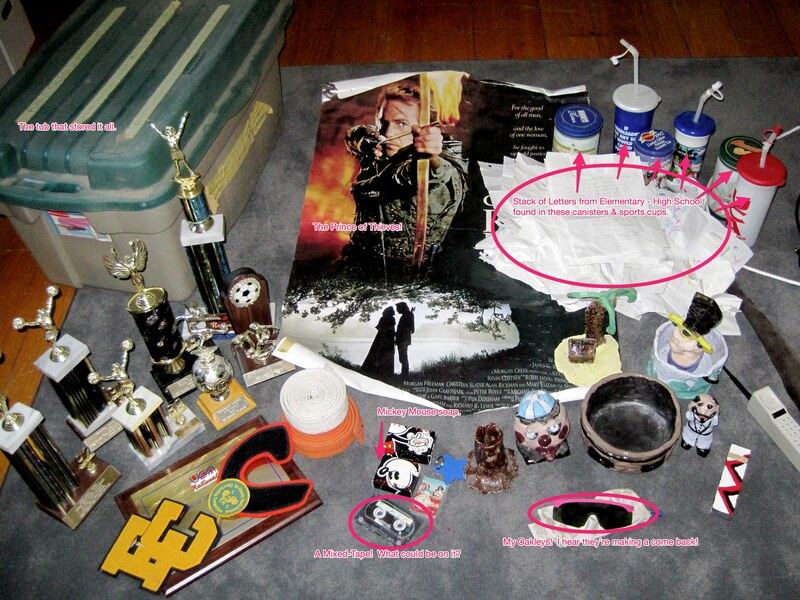 But first, here’s a picture of many (though not all) of the items I pulled from the bin. This prize goes to the trophies and awards found in the bin. I feel like this is a pretty common thing for people to hold keep. Who doesn’t want a piece of the glory days? 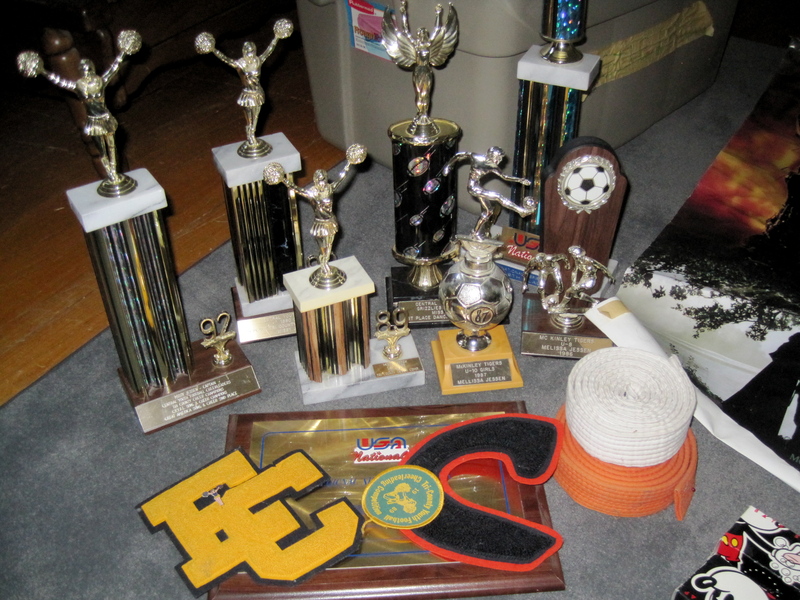 Though, my glory days include elementary school soccer and karate belts. Oh yeah, my sisters and I went through our Ralph Macchio/Karate Kid inspired dojo days like the best of ’em. And that’s not something in your eye, that’s the glint of not one, but multiple cheerleading trophies. Hey-oh! But don’t worry, that “Script C” was handed out to students who achieved academic excellence. So, I was a jock, a cheerleader, and a nerd. Watch out Beyonce, I’m a triple-threat, too! 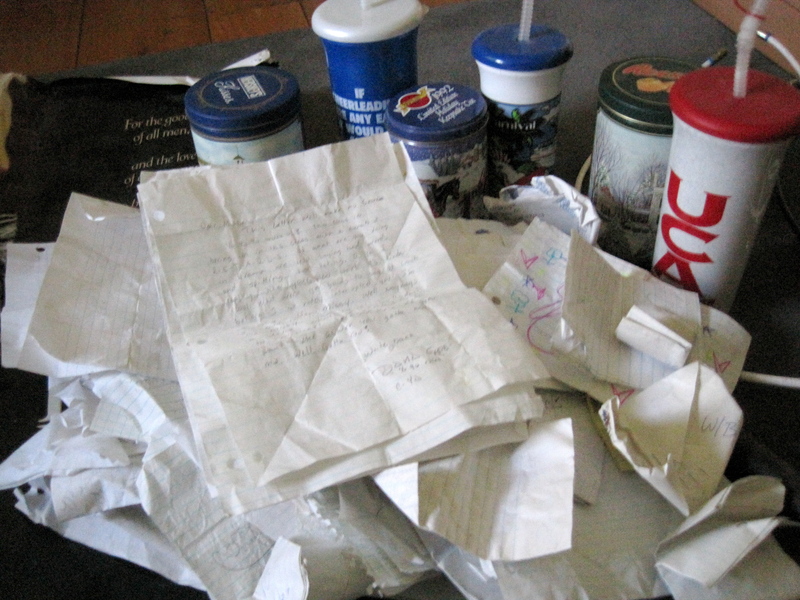 Inside each of these canisters and sports bottles, I found stacks and stacks and stacks of letters dating back to elementary school all the way through high school. In reading through the letters, I couldn’t help but wonder how different it must be for kids these days (wow, I think I just felt a hair on my head turn grey from saying that – “kids these days” – who am I?). In the letters I read, the authors often mentioned what was happening in class (you know the things they were avoiding doing by writing me a letter) and how long it would be before they would be able to hand me the note. For instance, if they were writing me the letter in homeroom, they may not see me until lunch. In which case, I may not respond to the letter until sixth period and then pass them my response after school. Now, kids can text each other and get an instant response. No more sweet anticipation (oh Carly Simon, your song would fall on deaf ears). From left: Is that a pencil holder or a dead tree? 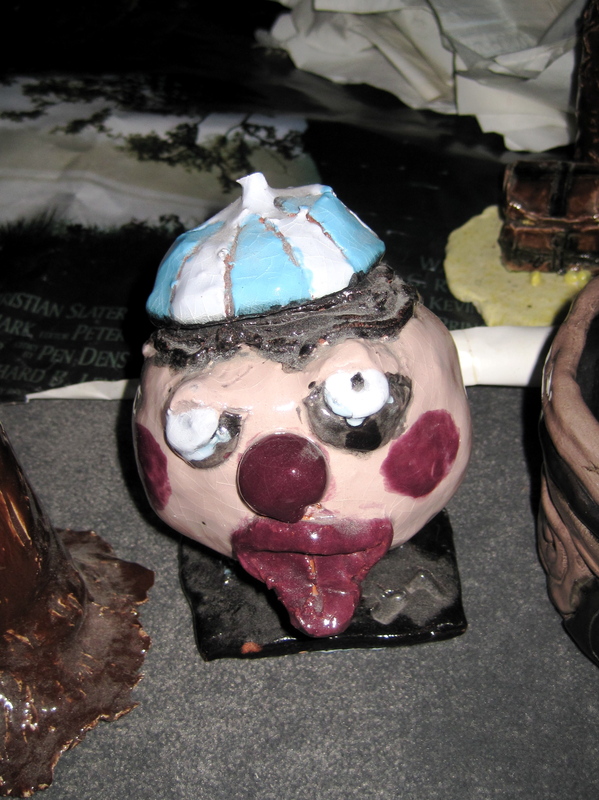 ; Clown-boy (see below); Coil Basket; Old West Doctor? 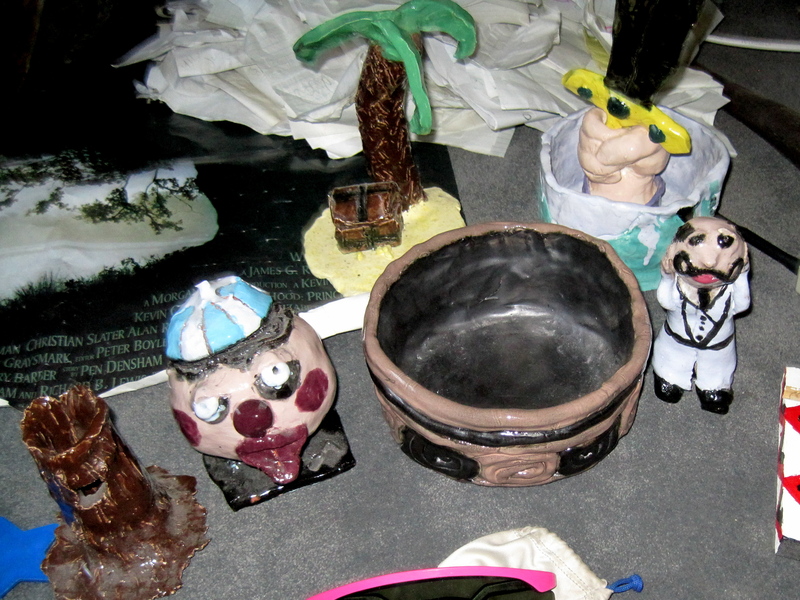 ; Excalibur Rises from Paint (my personal favorite); and a Deserted island (complete with treasure chest). As a junior in high school, I took a ceramics class. I was pretty proud of my work and wanted my mom to display it in the house. At our annual family Christmas celebration, I even suggested that she use my creations as dinner table centerpieces. My mom refused to put my artwork on display, however. I never understood why. When uncovering items in the bin, I picked up something heavy, wrapped in newspaper and let it unfurl in my lap. What I saw made me shriek with laughter. I laughed so hard I cried. I finally got it, mom! This stuff is horrifying! No wonder she didn’t want this displayed at the dinner table – it would make people sick. When Darrin came to investigate, I could hardly get the story out for all the laughing. I’m not sure what to do with these pieces. I’m pretty sure they’re not recyclable and I’m positive they don’t belong in the Goodwill pile. Maybe I’ll save them till Christmas and then wrap them up for family and friends – anyone interested in an MJ original? Closely on the heels of the last entry, I give you this little gem. Surely, this would give your children nightmares. You can’t tell me this isn’t total horror! Though this is part of my ceramics creations, it was worth of its own category. Anyone looking to freak out a friend? Starting bids open at $5.00. Ha! So, that’s everything in all it’s juvenile horror! What about you? Have you ever stumbled upon something you thought was lost or long forgotten? Do these things bring back some old memories? Share!